ATLANTA, April 4, 2019 /PRNewswire/ -- Booksmart Director, actress, activist and celebrity ambassador for Coca-Cola Regal Films program, Olivia Wilde, announced this morning via social media the 2019 winners for the student film program. The winning team Shayain Lakhani (producer) and Devon Solwold (director) from Savannah College of Art and Design (SCAD) will make their debut at Cinemacon in Las Vegas today alongside Wilde and their 30-second film Choose Happy, which will be shown exclusively at Regal theatres across the country starting in May this summer. "I've been so impressed with all the finalist films and it's been incredible to see what they've been able to create," said Olivia Wilde. "This program really gives young filmmakers the opportunity to get noticed in front of a large audience and the ability to leverage industry contacts, which is so important when you're first starting out." She added, "Choose Happy is a celebration of cinematic ambition, of truly taking advantage of the medium and exploring new ways to illustrate our imagination." "Olivia Wilde has been an incredible mentor for the program and her genuine enthusiasm and support for these young filmmakers is remarkable," said Ken Thewes, Chief Marketing Officer at Regal. "This is always a highlight of our year to present these students to the film and exhibitor industry and get a taste of Hollywood. We always receive such a wonderful response from our moviegoers who get to see their short spots on the big screen." 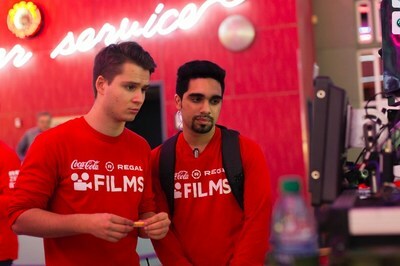 Students from 30 of the most diverse college and university film schools across the country participated in the 2019 Coca-Cola Regal Films program and five advanced to this year's finals. The finalists received $15,000 each to create and produce a 30-second film. In addition to funding, finalists were flown to Los Angeles for a training session and program kickoff event where they learned some tricks of the trade. At the training session, Olivia Wilde met with the students to provide mentoring insights and answer questions about her career. During production, each finalist had access to a Regal location, RED DSMC2 DRAGON-X camera kit and ZEISS cinema lenses free-of-charge, to produce his or her film. During post production, they were given access to Deluxe's EFILM to color finish their spots with some of the industry's top colorists. The grand-prize winning film will debut at Regal theatres nationwide. In addition, they will receive a RED DSMC2 DRAGON-X camera kit and ZEISS cinema lenses to further their careers. "Once again we have an amazing group of finalists and wonderful films. We're so proud of our partnership with Regal on this work and how it helps us all support the future of filmmaking for the big screen," said Krista Schulte, SVP Coca-Cola North America Strategic Partnership Marketing. The finalists' films are available to watch online at CocaColaRegalFilms.com. Annapurna Pictures' Booksmart is Olivia Wilde's feature film directorial debut which will be released nationwide by United Artists Releasing on May 24th. The film is an unfiltered comedy about high school friendships and the bonds that last a lifetime. Booksmart is told from a wildly original, fresh and modern perspective, capturing the spirit of our times; it is a coming of age story for a new generation. Earlier this year, Wilde was named one of Variety's 10 Directors to Watch in 2019, and Booksmart was one of the first feature films in 2018 to receive the Women in Film ReFrame accreditation. The ReFrame Stamp serves as a mark of distinction for projects that have demonstrated success in gender-balanced films. The Coca-Cola Company (NYSE: KO) is a total beverage company, offering over 500 brands in more than 200 countries and territories. In addition to the company's Coca-Cola brands, our portfolio includes some of the world's most valuable beverage brands, such as AdeS plant-based beverages, Ayataka green tea, Costa coffee, Dasani waters, Del Valle juices and nectars, Fanta, Georgia coffee, Gold Peak teas and coffees, Honest Tea, innocent smoothies and juices, Minute Maid juices, Powerade sports drinks, Simply juices, smartwater, Sprite, vitaminwater and ZICO coconut water. We're constantly transforming our portfolio, from reducing sugar in our drinks to bringing innovative new products to market. We're also working to reduce our environmental impact by replenishing water and promoting recycling. With our bottling partners, we employ more than 700,000 people, helping bring economic opportunity to local communities worldwide. Learn more at Coca-Cola Journey at www.coca-colacompany.com and follow us on Twitter, Instagram, Facebook and LinkedIn.